Today is Ryan’s birthday – yayyyy happiest of birthdays to my wonderful husband! It’s so rare I’m actually timely with posts, but I guess it’s kind of lying today since I made this baklava a few months ago for our annviersary. 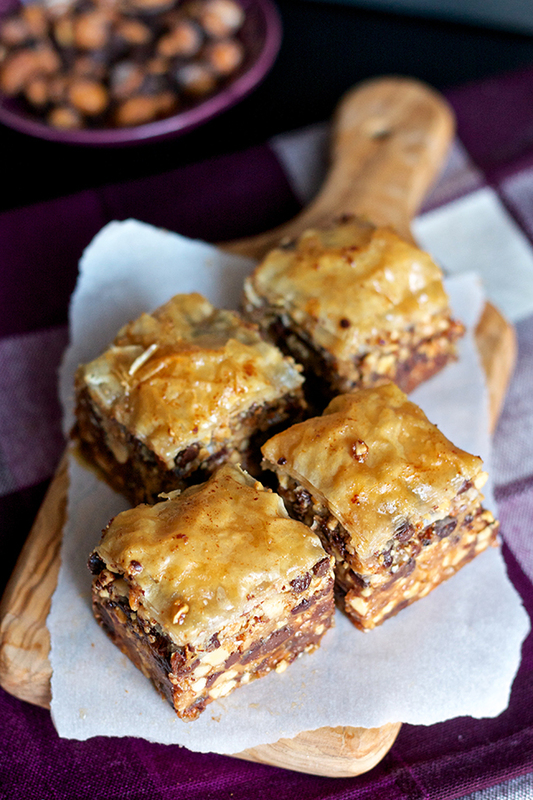 Either way, this post is dedicated to him since baklava is something he’s been begging me to make for years. YEARS! (Speaking of years, my 5th blogoversary was a few weeks ago. Remember how I’m not usually very timely with posts? Oh well…) Anyway, Ryan has had a list of random desserts he’s wanted me to make for him – cream puffs and bread pudding to name a few – and I’ve gotten a habit of trying them out just around a special occasion involving him. Last year for his birthday I actually wimped out a bit and had baklava ordered to his office via Seamless, but this year I’m posting his very own baklava recipe on his big day! Granted there is no baklava to be eaten today, but he is getting one of the best burgers in NYC tonight, so I doubt there will be much complaining. Just like creams puffs and bread pudding, I’ve never really been quite as mesmerized by baklava as Ryan. I’m always more tempted by the chocolate offerings, and I’ve never been a huge fan of honey anyway. But honey roasted peanuts, peanut butter, and chocolate in baklava? I could definitely get into that. Plus, I love phyllo dough! 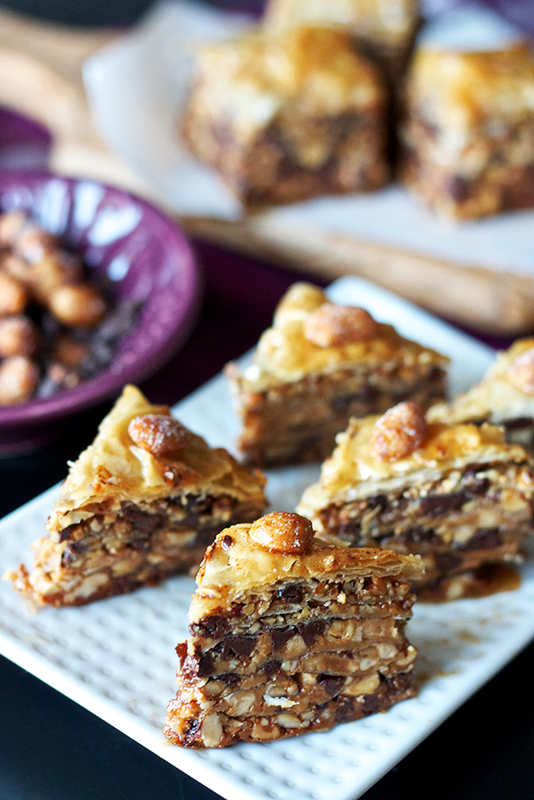 Baklava is traditionally made by layering phyllo dough with honey and some kind of nuts (walnuts, pistachios, pecans), but I switched things up for my version to include peanut butter, peanuts, and mini chocolate chips for my peanut butter-obsessed husband. I felt like I was still kind of staying true to the original essence of baklava since we’re using nuts and a lot of honey. It’s just so beautiful (in a beautifully messy way) how it all bakes up with those pretty, flaky tops and the intricate layers stacked on top of each other. Despite its beauty, be warned – this dessert is not for the faint of sweet tooth-heart. 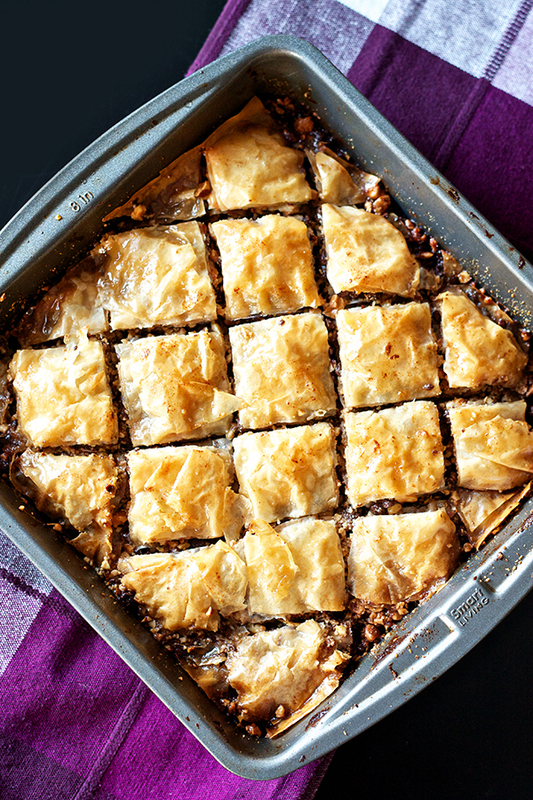 It’s rich, decadent, and like all baklava recipes, quite sweet! But who doesn’t want an overly peanut buttery, sweet, and chocolately treat for their birthday?? For this recipe, you want everything all ready to go before you start assembling. First, preheat your oven to 350 degrees and spray an 8x8 (or 9x9) pan with nonstick cooking spray or butter. Place melted butter in a bowl and have a pastry brush nearby. Microwave peanut butter for 30 seconds in the microwave (you want it liquidy, so maybe more than 30 seconds depending on the consistency) and set aside. Place the chopped peanuts another bowl and mix in the chocolate chips. Unwrap the roll of phyllo dough onto a cutting board and cut it in half, so it is the size of your prepared pan. Cover the phyllo dough with a layer of plastic wrap and place a damp kitchen towel over the top - it's important to keep any dough you're not actively using covered or it will dry out quickly! Uncover the phyllo and brush the top sheet with melted butter. Grab it with your fingers, along with the sheet under it (so you're taking 2 sheets) and place the 2 sheets into the pan, butter side down. Repeat two more times, so you have six sheets of phyllo in the pan. 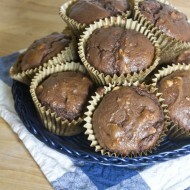 Pour about 2-3 tablespoons of peanut butter over the top and spread. 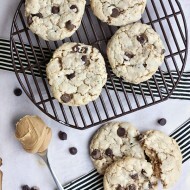 Sprinkle with the mixture of peanuts and chocolate chips.Butter another top sheet of phyllo and grab the one below it (so you have 2 sheets) and place them, butter side down, on top of the peanut butter layer. 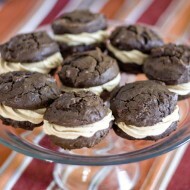 Pour another 2-3 tablespoons of peanut butter over the top and spread evenly. Sprinkle more peanuts and chocolate chips on top. Repeat this about four more times, or until you are out of peanut butter. Butter another phyllo sheet and grab the one below it (so you have two sheets) and place them, butter side down, on top the peanut butter layer. Repeat this two times, so you have 6 layers on top of your last peanut butter layer. Butter the top of the baklava. Before baking, use a sharp knife to cut your baklava into diamonds (or squares if you don't want to be as traditional). Bake about 45 minutes, until the baklava is golden brown. While the baklava is baking, combine the water, sugar, honey, and vanilla in a saucepan and bring to a boil over medium heat. Then reduce the heat to low until the baklava is done baking. When the baklava is done, pour the honey mixture on top, making sure to get into all of the nooks and crannies. Let cool completely, uncovered, for several hours until enjoying. 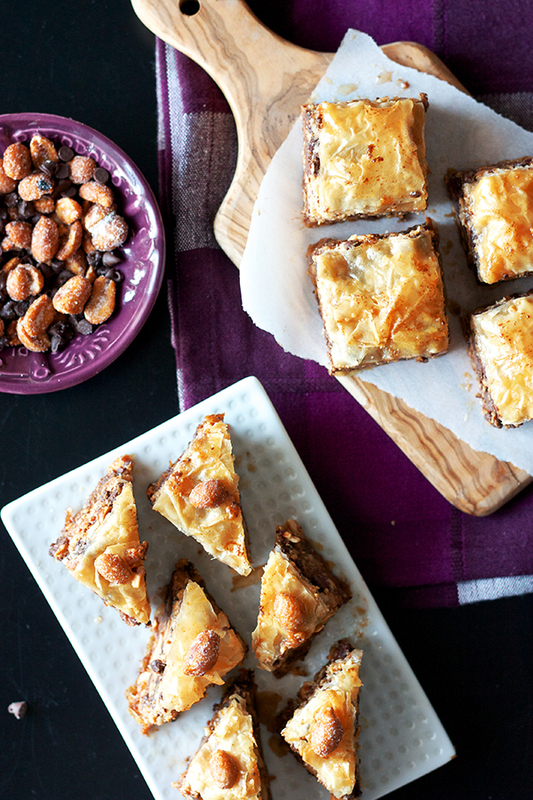 CHOCOLATE AND PEANUT BUTTER BAKLAVA?! You are brave to be making this dessert. Btw, if you haven’t tried yet another amazing burger place is 5 napkin burger, midtown. Sooo delicious. Where other great restaurants have you been to lately? Always looking for new recommendations. We do like 5 Napkin – we live right near the Hell’s Kitchen location! Other burgers Ryan has loved is Umami, Breslin, and Shake Shack. What a deliciously great idea! Pinned this one! Thanks for sharing it is their our Dinner party! Have an awesome week.